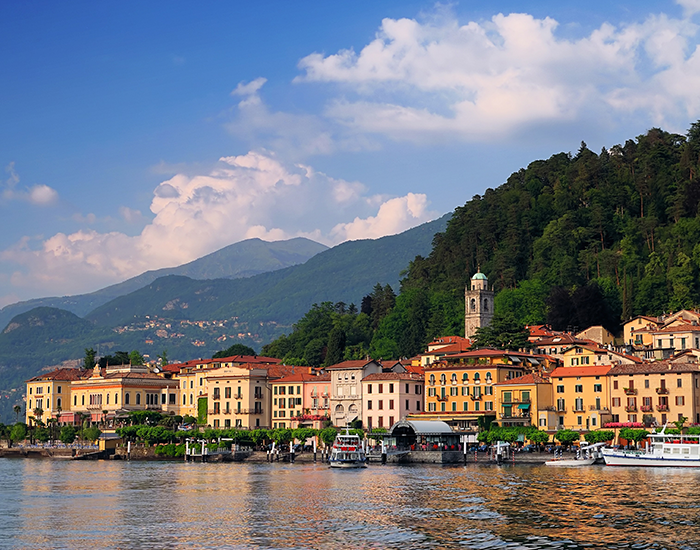 Bellagio is situated upon the cape of the land mass that divides Lake Como in two. The city centre occupies the tip of the promontory, while other districts are scattered along the lake shores and up the slopes of the hills. The great Pleistocene glaciations with their imposing flows coming from the Valtellina and Valchiavenna modelled the actual landscape of Lake Como: at least four times the glaciers went as far as Brianza to the south. From the ancient glacial blanket only the highest tops emerged, one of them Mount St. Primo, which obliged the glaciers to divide into two arms. Nowadays, a luxuriance of trees and flowers is favoured by a mild and sweet climate. The average daytime temperature during winter is rarely below 6 to 7 °C (43 to 45 °F), while during summer it is around 25 to 28 °C (77 to 82 °F), mitigated during the afternoon by the characteristic breva, the gentle breeze of Lake Como. 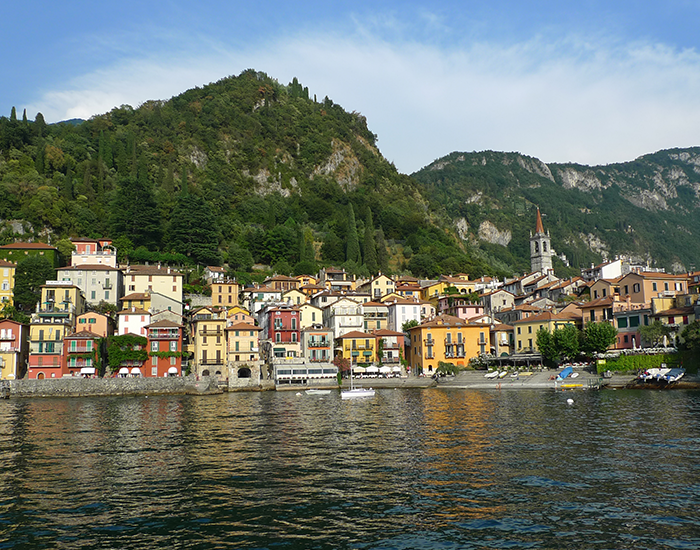 The historic centre of Bellagio shelters 350m southwest of the promontory of the Larian Triangle, between the Villa Serbelloni on the hill and the Como arm of the lake. At the far tip of the promontory are a park and a marina. Parallel to the shore are three streets, Mazzini, Centrale and Garibaldi in ascending order. Cutting across them to form a sloped grid are seven medieval stone stairs (“salite”) running uphill. The Basilica of San Giacomo and a stone tower, sole relic of medieval defences (“Torre delle Arti Bellagio”), sit in a piazza at the top. 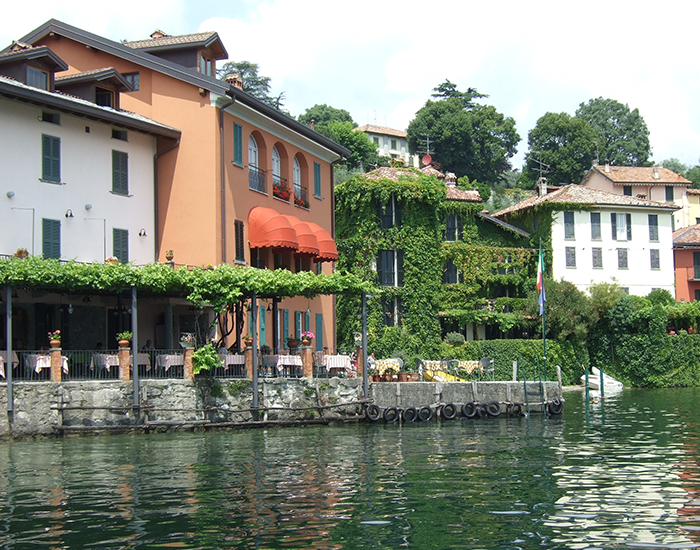 Along the banks of the promontory of Bellagio are many old patrician houses, each surrounded by parks and gardens of trees. 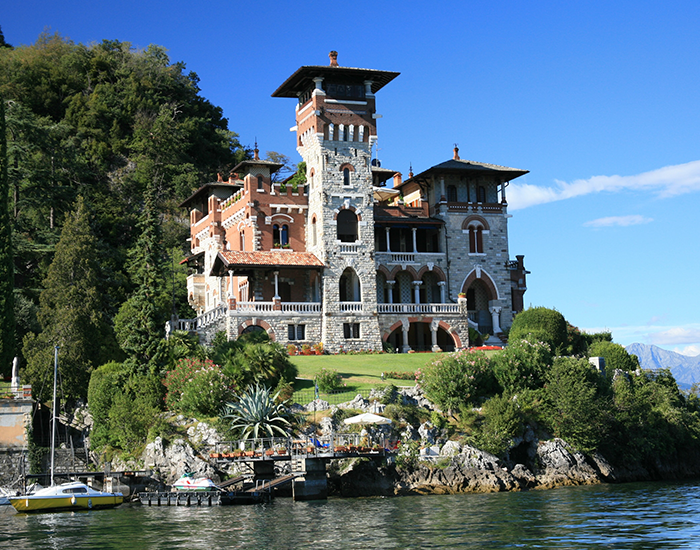 Some like Villa Serbelloni and Villa Melzi d’Esti are open to the public. Just behind the hill of the promontory into the lake, protected from the winds, is the building complex of Villa Serbelloni. The villa dominates the town’s historic centre. It can be reached from Via Garibaldi. It was built in the fifteenth century in place of an old castle razed in 1375. Villa Serbelloni was later rebuilt several times. In 1788 it came into the possession of Alessandro Serbelloni (1745–1826) who enriched it with precious decorations and works of art of the 17th and 18th centuries.Today you can visit only the gardens. 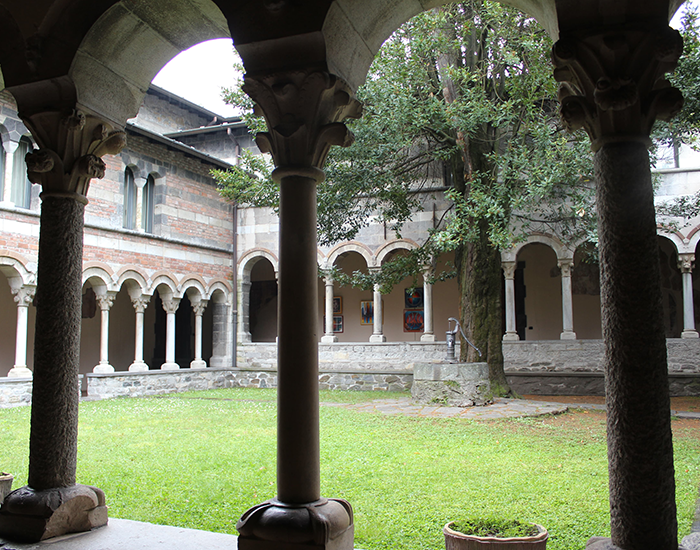 The trails, as well as the villa, lead to the remains of the 16th century Capuchin monastery and the Sfondrata, a residence built by the Sfondrati family indeed, overlooking the Lecco branch of the lake. This significant building overlooking the lake was built between 1808 and 1815 by the architect Giocondo Albertolli for Francesco Melzi d’Eril, created Duke of Lodi by Napoleon for whom he filled the role of vice-president of the Italian Republicfrom 1802. From 1805, with the advent of the short-lived Napoleonic Kingdom of Italy, he was its Chancellor. The picturesque village of Pescallo, is located southeast of the Bellagio promontory, overlooking the Lecco branch of Lake Como. Arriving in Pescallo will be enchanted by this ancient little village nestled between the green and the lake, rich in many romantic spots to be discovered that offer the visitor wonderful views. Once known as a fishing village, today Pescallo is a real gem with a small harbor where you can enjoy a beautiful view of the lake, the historic village houses and narrow alleys that connect you to the village center of Bellagio with a short walk through a stairway that crosses the promontory surrounded by nature among olive trees and Mediterranean vegetation. Villa Carlotta is a villa and botanical garden in Tremezzo. The villa is today a museum, whose art collection includes works by Canova, Thorvaldsen, Migliara and Hayez in addition to pieces of furniture from the time of the various owners. 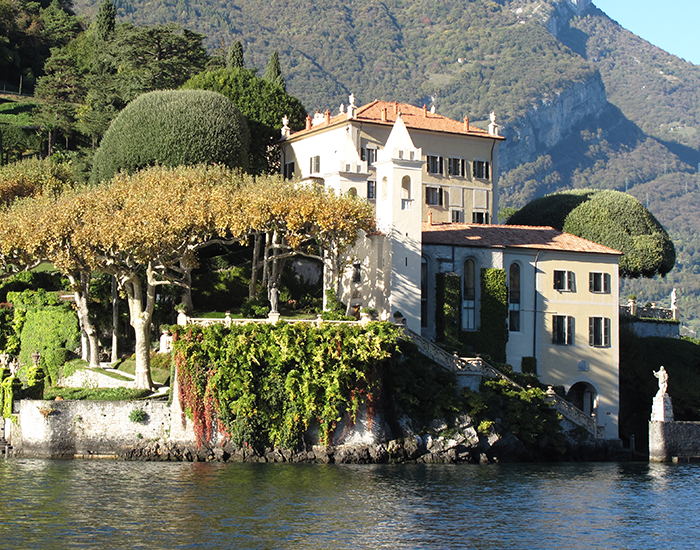 The villa and surrounding grounds are located on the lakeshore at Tremezzo, facing the Bellagio peninsula. An Italian garden with steps, fountains and sculptures was laid out at the same time. The villa is located at the top of a terraced garden, from which there are views of Bellagio and also the mountains surrounding the lake. It consists of three floors (two of which are open to the public). The works of art on display are mainly located on the lower floor, while the upper one, which has an elegant gallery, provides views over the lake. The botanical garden covers an area of about 8 ha (20 acres)and consists of several different sections. Immediately around the villa, towards the lake, the Italian garden with cut hedges and pergolas with orange and camellia trees. The rhododendron and 150 varieties of azalea spread up the slope. The property is also home to cedars, palms, redwoods, plane trees and other exotic plants. there is also a bamboo garden, covering 3000 m² which is home to over 25 different bamboo species. A greenhouse which had been used in the past to house citrus fruits during winter has been converted into a museum of old farm tools. The Villa del Balbianello is a villa in the comune of Lenno (province of Como), Italy, overlooking Lake Como. It is located on the tip of the small wooded peninsula of Dosso d’Avedo on the western shore of the south-west branch of Lake Como, not far from the Isola Comacina and is famous for its elaborate terraced gardens. A Franciscan monastery had existed on the tip of the peninsula of Dosso d’Avedo since the 13th century. The two towers which remain on the property are the campanili of the monastery’s church. After failing in his attempts to buy the nearby Isola Comacina Cardinal Angelo Maria Durini purchased the property in 1785. In 1787 he converted the monastery building into a villa for use during the summer and added a loggia, which allowed viewers to otain two different panoramas of the lake. After the cardinal’s death in 1796, the villa passed to his nephew, Luigi Porro Lambertenghi. During Lambertenghi’s ownership the villa became a seat of republican activity and members of the Carbonari met here to discuss the unification of Italy. Among Lambertenghi’s guests at the villa were the writer and patriot Silvio Pellico, who tutored Lambertenghi’s sons. In 1820 Pellico was arrested at the villa by the Austrian government which forced Lambertenghi to move to Belgium, where he was supported by the Arconati Visconti family. Just prior to the commencement of World War I American businessman Butler Ames saw the villa for the first time. He made an offer to purchase it from the Arconati Visconti family and was initially rejected. He kept returning with ever-larger cash offers until in 1919 he was successful in obtaining ownership. Ames renovated the villa and its garden. In 1974, Ames’s heirs sold the villa to businessman and explorer Count Guido Monzino (leader of the first Italian expedition to climb Mount Everest. While Monzino left the exterior essentially unchanged he had the interior of the villa completely re-decorated, installing artifacts acquired on his expeditions as well as important pieces of English Georgian and French antique furniture from the 18th and 19th centuries, Beauvais tapestries, French boiseries and Oriental carpets. In addition after the assassination of Aldo Moro in 1978 by the Red Brigade. Monzino worried that he may be on their list, added a system of hidden passages, linking parts of the property. Monzino died in 1988 and left the villa along with most of the Dosso d’Avedo and an endowment to pay for maintenance, to the Fondo per l’Ambiente Italiano, the National Trust of Italy. Its grounds now form part of the Grandi Giardini Italiani. Today the Villa del Balbianello is the most visited among the 52 FAI properties with over 100,000 visitors in 2017. A number of feature films have used the villa for location shooting, including A Month by the Lake (1995), His Demise starring Paul Zukowski (2016 disaster movie), Casino Royale (2006). The villa was also used for the lake retreat scenes in Star Wars: Episode II Attack of the Clones (2002) however CGI was used in place of the building’s true exterior. 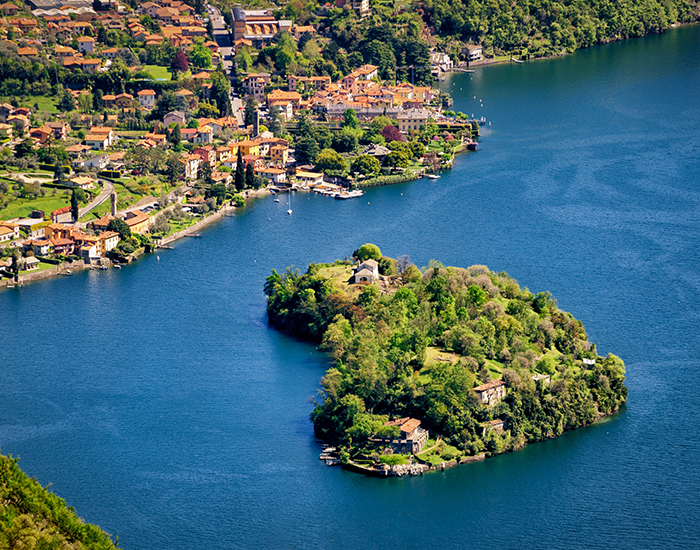 Is a small wooded island of Italy’s Lake Como, administratively a part of the comune of Ossuccio. 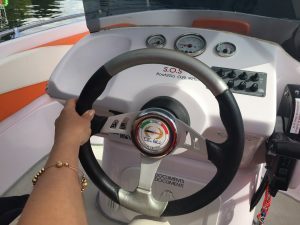 It is located close to the western shore of the Como arm of the lake in front of a gulf known as Zoca de l’oli, a Lombard name referring to the local small-scale production of olive oil. In the late 6th century (c. 587) the island was a remaining Romanstronghold under Francio, a subordinate of Narses; though the areas surrounding Lake Como were entirely controlled by the Lombards. The island was besieged for a good deal of time by the Lombards under Authari who released Francio to flee back to Narses‘ capital at Ravenna. The Lombards found the island to contain “many riches” deposited for safekeeping by local Roman loyalists. In 1919 the island was given to Belgium, in homage to King Albert I. The island was returned the following year. Pietro Lingeri built three houses on the island in 1939. His idea was to turn the island into a colony for artists. The houses were built in a rationalist style, made from local materials and without much decoration. The Romanesque church of Santa Maria Maddalena features an unusual slender bell tower with a burgeoning belfry on top. The 12th century church of San Giacomo houses ancient frescoes. 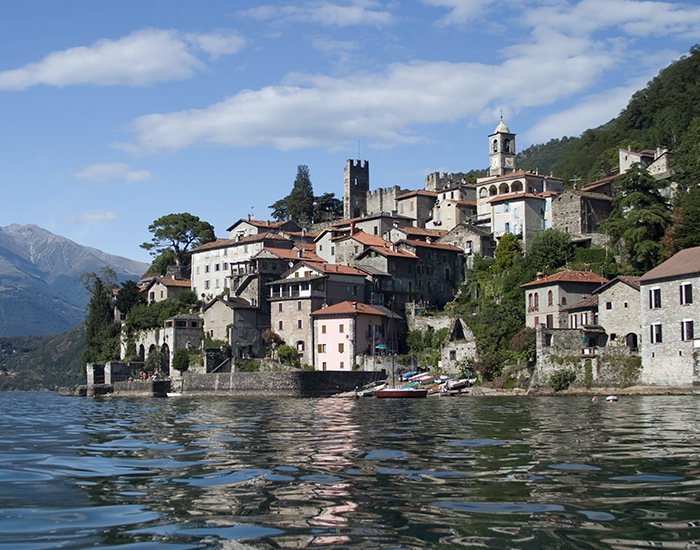 Ossuccio enjoys both worlds – the lakefront and the natural beauty of the mountains. The town is most known for its UNESCO Heritage Site, the Sacro Monte. Trails connect the cluster of mountain chapels and sanctuaries scattered around the surrounding area. It was named a heritage site for its spiritual significance and the way it integrated Renaissance and alpine architecture into the natural surroundings of lakes, hills and forests. There are artistic treasures displayed throughout, and it has been a place of pilgrimage since the 1600s. The famous Nesso Gorge, locally known as Orrido di Nesso, probably one of the best natural wonders that you can find around the lake. Enjoy a stunning view of the waterfall from Ponte della Civera, a Romanesque bridge made of stone. It’s a real paradise for nature lovers. And once you’re there, you can also take the opportunity to refresh yourself with a swim in the lake. The eighteenth-century Villa Oleandra in Laglio is the very well-known summer residence of George Clooney, who since 2002 has chosen this quiet village located on the western shore of Como Lake to spend his vacations, sometimes in the company of other Hollywood celebrities. Obviously, the presence of Clooney brought a little of hustle in Laglio, that suddenly has became a destination for an army of paparazzi, fans and the merely meddlers to the point that the City Council has approved an ad hoc regulation to protect the privacy of the actor. According to this regulation, it’s forbidden the transit in the immediate vicinity of the entrance of the villa (also by the lake). The order clearly does not apply to residents of Laglio. The complex of Villa Oleandra is present in the cadastral maps of Laglio since 1720, although with different shapes than the current state. In 1834, the owners of the time, the Stoppani family, built a first unification of the building with the surrounding land, then completed in 1868 by the family Antongini. In 1877, the building, which corresponded to the last current plan, went to the family Vitali. In the meantime, the whole complex had been converted into a residence, as shown by a reproduction of 1848. During the twentieth century Villa Oleandra was sold to American owners, the last of which was the family of the billionaire John Heinz. In the summer of 2001, the heirs of the “King of ketchup” provided aid for the lost George Clooney, jilted by his Harley-Davidson just outside the gates of the villa. The American actor, who was taking a ride on the mighty Alps aboard his motorcycle, fell in love at first sight of Villa Oleandra, especially because of the breathtaking view that you could see from its windows, and soon decided to buy it for about 10 million dollars. Since then, the door of the luxury building, located in Via Vecchia Regina 20 and surrounded by a large botanical garden, was crossed by numerous Hollywood celebrities, all guests of George Clooney, including Cindy Crawford, Brad Pitt, Matt Damon, Catherine Zeta Jones and Michael Douglas. 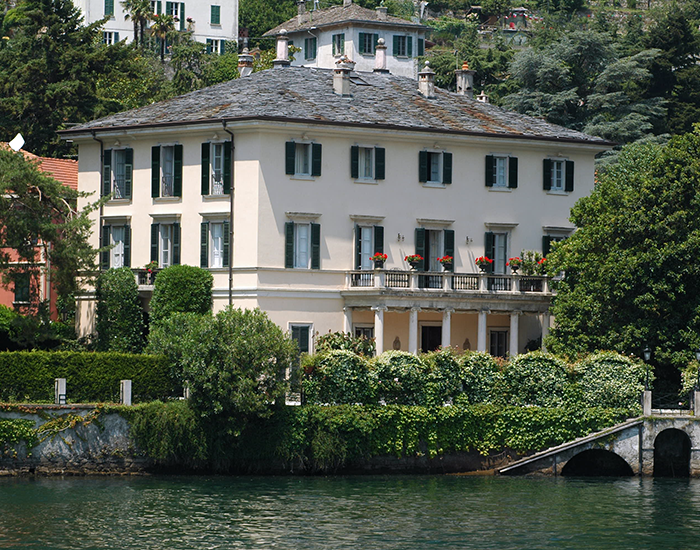 This James Bond Villa is located, in San Siro, surrounded by a beautiful park with paths, benches and a lit fountain. In the spring of 2006, the movie Casino Royale was filmed in front of this villa (the last scene of the movie when Bond meets Mr. White). 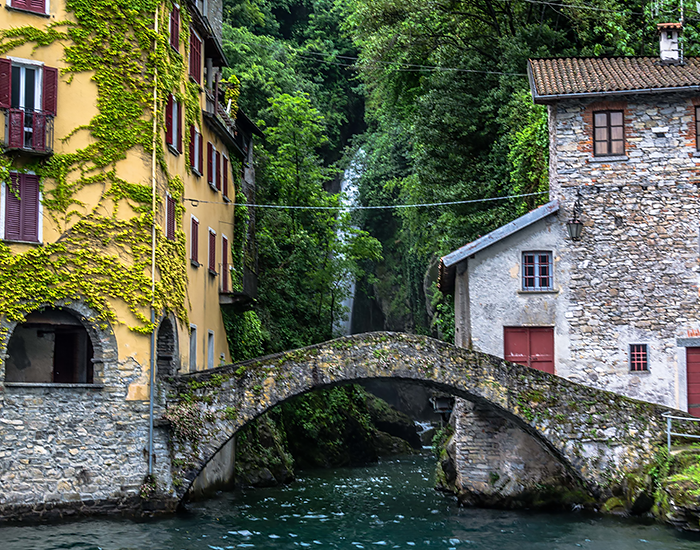 Varenna was founded by local fishermen in 769, and was later allied of the comune of Milan. In 1126 it was destroyed by the rival comune of Como, and later received the refugees from the Isola Comacina, who had met the same fate (1169). The main sights are the Castello di Vezio, a small museum dedicated to Lariosaurus (a Middle Triassic sea reptile related to turtles), as well as the beautiful gardens at Villa Monastero. 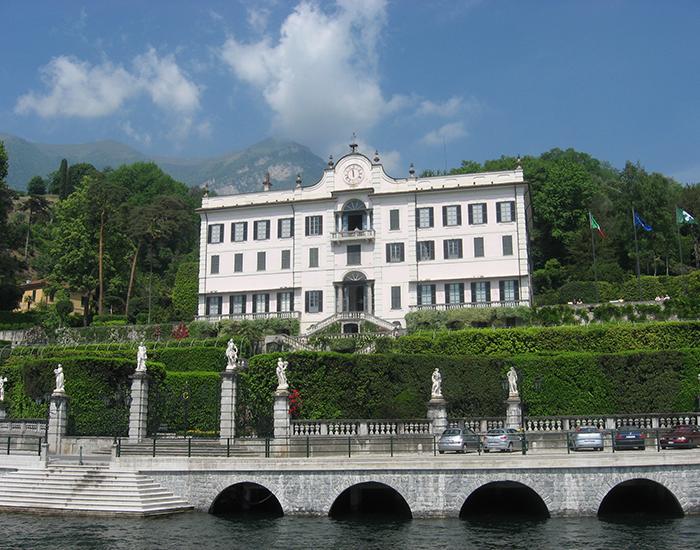 Villa Monastero, in between Varenna and Fiumelatte is nowadays a museum, botanical garden and convention center. It was founded as a Cistercian monastery in the 11th or 12th century. The castle of Corenno Plinio, district of Dervio, has a centuries-old history and nowadays it’s one of the best preserved castles in Lombardy. Built between 1363 and 1370 on ancient Roman ruins, by will of Andreani’s family, it has a square shape, even if irregular, and two towers: a square one dated back to the 11th century (north side and visible when you are on the road) and a C shape one at the castle’s entrance in Piazza Garibaldi. Piazza Garibaldi, with its pebble floor, lets you breathe the medieval past of Corenno Plinio and welcomes you with its castle and the closechurch dedicated to St. Thomas Beckett of Canterbury, with its Neo-gothic tombs of Andriani’s family. The castle of Corenno Plinio is a walled castle and it was built and used as a refuge for the local inhabitants to safeguard themselves from invaders’ attacks. Its strong walls built with the local stone are adorned by battlements. Actually the castle still is a private property, but it’s open for visit. The abbey is set at the top of a small peninsula, the Olgiasca, which – like a crooked finger – points into the lake, creating an inlet. The original church of Saint Justina was founded in the 7th century; the ruins of an apse behind the current church of San Nicola belong to this original edifice. A new church was added some centuries later, though before 1138, as testified by an inscription reporting its reconsecration in that date. which was followed – some centuries afterwards – by a priory, with its monastery complex, part of the political-religious network which was led by Cluny and its reform movement. The location, although away from the main town, was on a military route of critical importance in the wars of the times. Lecco is a city of 48,131 inhabitants in Lombardy, northern Italy, 50 kilometres north of Milan, the capital of the province of Lecco. 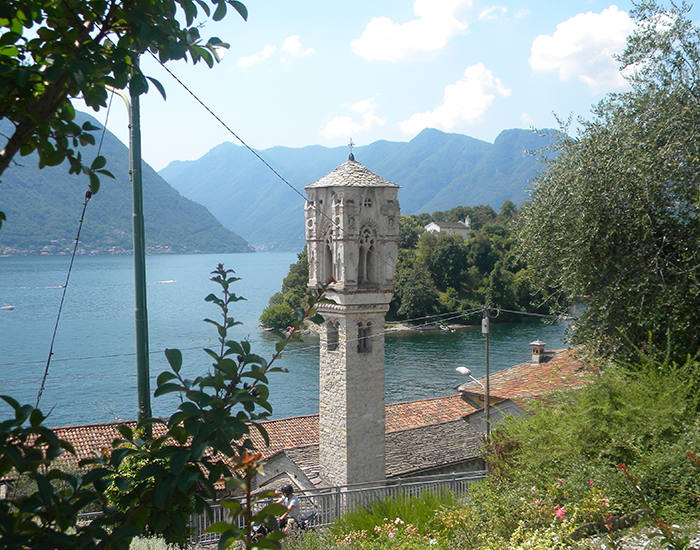 It lies at the end of the south-eastern branch of Lake Como. The Bergamo Alps rise to the north and east, cut through by the Valsassina of which Lecco marks the southern end. The lake narrows to form the river Adda, so bridges were built to improve road communications with Como and Milan. There are four bridges crossing the river Adda in Lecco: the Azzone Visconti Bridge, the Kennedy Bridge and the Alessandro Manzoni Bridge and a railroad bridge. Its economy used to be based on industry, but now it is mainly tertiary. 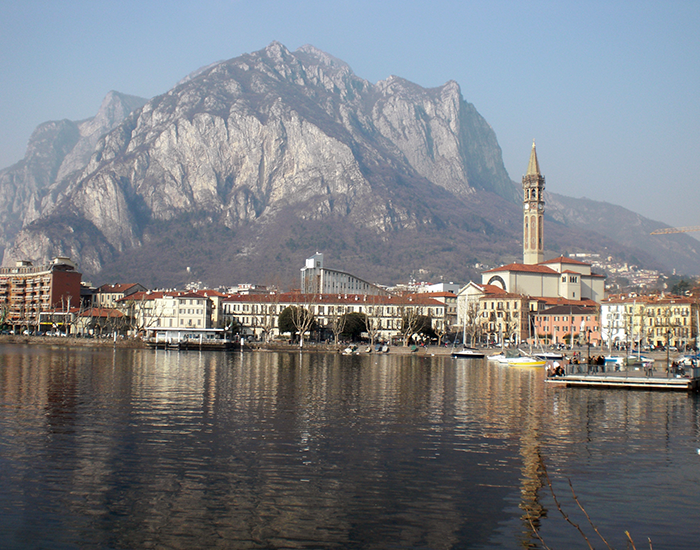 Lecco was also Alpine Town of the Year 2013. The proximity to Lake Como and to the Alps has made Como a tourist destination and the city contains numerous works of art, churches, gardens, museums, theatres, parks and palaces: the Duomo, the Basilic of Saint Abbondio, the Villa Olmo, the public gardens with the Tempio Vopltiano, the Teatro Sociale, the Broletto (the city’s medieval town hall) and the 20th century Casa del Fascio. With 215,320 overnight guests, in 2015 Como was the fourth most visited city in Lombardy after Milan, Bergamo and Brescia. 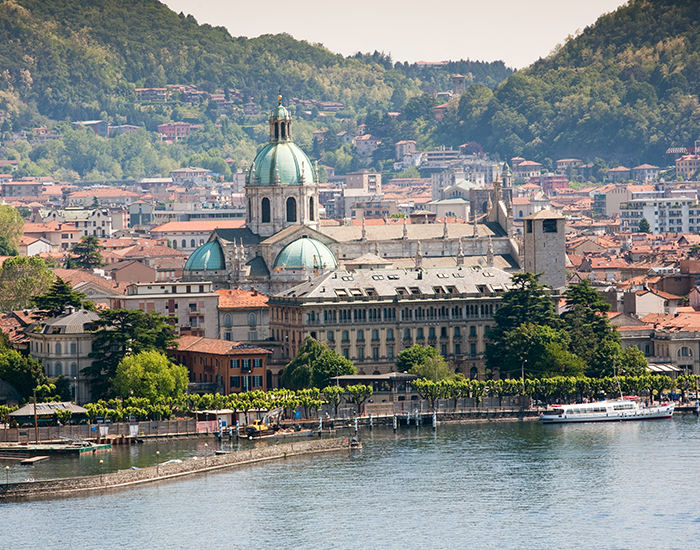 Como was the birthplace of many historical figures, including the poet Caecilius mentioned by Catullus in the 1st century BCE, writers Pliny the Elder and the younger, Pope Innocent XI, scientist Alessandro Volta and Cosima Liszt, second wife of Richard Wagner.